Christianity101: The Rosary is Blasphemy Against God! The rosary is a damnable heresy, nowhere taught in the Word of God. I am saddened that so many people have fallen hook, line, and sinker for the damnable teachings of the Roman Catholic religion. I say "damnable teachings" because they are NOT based upon the Bible, but rather upon traditions and superstitious fairytales (like Fatima). The following GREEN paragraphs is from www.Catholicity.com, titled "The Fifteen Promises of the Rosary." I am going to refute these lies with the Bible, my responses will be in bold white type. 1. To all those who shall pray my Rosary devoutly, I promise my special protection and great graces. 2. Those who shall persevere in the recitation of my Rosary will receive some special grace. And so on...it lasted for several minutes. Ironically, Catholics adamantly deny that they pray to Mary. What? Then what do you call the above chants? The nuns were reciting over and over...Mary, Queen of ____...we pray to thee." They are indeed praying to Mary, wickedly so! Folks, please do NOT be deceived by the devil, Roman Catholicism is straight out of the pits of hell. Jesus Christ is the ONLY Way to heaven, not the blessed virgin Mary. Furthermore, Mary did not remain a virgin (contrary to the perpetual virginity teachings of the Catholic religion). Please don't be deceived by the double-talk of Catholics. In one breath they admit that Mary is not the way to heaven, yet as you will read in promise # 5 below, they do teach that praying the rosary to Mary guarantees heaven. God does not play Word Games like Catholics do; God said what He meant, and we had better listen to Him or else. Romans 3:4 declares, "... let God be true, but every man a liar..."
God is everything, and we desperately need God. Roman Catholics foolishly and sinfully ADD Mary to the list. God will NOT accept any worship that includes Mary or anyone else. Also, praying the rosary can't dispel heresy because it is heresy itself. The Bible teaches that heresy is exposed by shining the light of God's Word upon the darkness. The Bible is a "lamp" unto our feet to light the path. God's Holy Spirit is our guide to "guide us into all truth"
If a doctrine doesn't fit within the parameters of the Bible, then it is heresy! If you don't like this, then it is only because you do NOT believe the Bible. Praying the rosary will do nothing but waste your time and upset God. 4. The rosary will make virtue and good works flourish, and will obtain for souls the most abundant divine mercies. It will draw the hearts of men from the love of the world and its vanities, and will lift them to the desire of eternal things. Oh, that souls would sanctify themselves by this means. It is the Word of God that sanctifies us (sets us apart "from" the world and "to" God). Catholicism elevates the rosary above the Word of God. The rosary cannot sanctify you. How can you be sanctified by repeating a bunch of vain repetitions? The term "hail Mary" is NOT even mentioned once in the Bible! Not once! Think about it. You can pray a million rosaries and trust Our Lady of Fatima (Mary) with all your heart, but you WILL go straight to hell when you die and face the judgments of God. God sent His Son into the world to pay the price, the ransom, for our many sins. Jesus Christ has made salvation available to all men, all you need to do is to forsake your false religion, and place 100% of your faith in Christ alone, not the Great Whore of Catholicism. By the way, Mary (Jesus' mother) is not the great Whore, Mary of the Roman catholic church is the Great Whore. Roman Catholicism has created a MONSTER out of Mary that is all a big lie. False doctrines such as "the assumption of Mary, "the "Immaculate Conception of Mary," and Mary's "Perpetual Virginity" are fictitious lies of the devil nowhere found in the Bible. 6. Whoever recites my Rosary devoutly reflecting on the mysteries, shall never be overwhelmed by misfortune. He will not experience the anger of God nor will he perish by an unprovided death. The sinner will be converted; the just will persevere in grace and merit eternal life. "Never be overwhelmed with misfortune"? Again, it sounds great but it's simply NOT true, Catholics suffer from misfortune just like all other human beings do. We live in a fallen world and suffering is simply a part of this temporal life, Christian or not. Being a Christian doesn't necessarily make life any easier, but it does make life better because you have the Lord Jesus Christ by your side all the time. At what point did Mary become a superstar? It surely didn't happen in the Bible. Roman Catholics and even Lutherans disgracefully elevate Mary to extreme levels NOT taught anywhere in the Scriptures. Mary was a sinful, but virtuous, human being who was graciously chosen by God to be used as a vessel to bring Christ into the world. Mary has no special position or recognition with God. Mary is NOT the "mother of God," God has no mother. Mary was the mother of the man Jesus Christ, but the incarnate Godhead has no mother. Jesus Christ had NO earthly father, but was conceived by a miracle of the Holy Spirit of God. Mary was a good and respectable woman, but she was still a hell-deserving sinner, just like any other virtuous lady who is a child of God. 7. 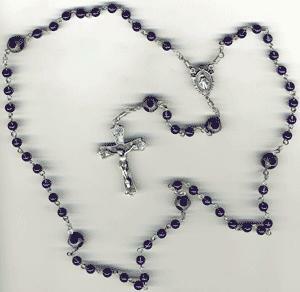 Those truly devoted to my Rosary shall not die without the sacraments of the Church. Can't you see that the Vatican wrote this garbage? Fatima is a big Hoax! The Catholic religion is raking in billions upon billions of dollars from foolish people who are following the Unbiblical traditions of men. So now Mary is telling you that you need the sacraments if you really mean business, and if you don't mean business then you have no guarantee of heaven. This is how the Catholic religion subtly mandates the sacraments. Do you see the gimmick in all of this? Every Catholic that I speak with says that the sacraments are not necessary for salvation, yet the black and white teachings of Catholicism contradict them. 8. Those who are faithful to recite my Rosary shall have during their life and at their death the light of God and the plenitude of His graces and will share in the merits of the blessed. By the way, I've never heard a Catholic priest yet encourage his listeners to study the Bible for themselves. The Bible is the BIGGEST ENEMY of the Roman Catholic Church. 9. I will deliver promptly from purgatory souls devoted to my Rosary. There is NO such teaching as purgatory in the Bible. The foolish rich man in Luke 16 died without Christ and went straight to hell to suffer in torment. Jesus never said it was a parable (as He always did when He told a parable). Literal names were used (Lazarus, Abraham). It wasn't a "certain man" in a "certain place," the details were specific. We must accept the account as real. There is no teaching in the Bible of a temporal place of punishment. 10. True children of my Rosary will enjoy great glory in heaven. The above three promises of Our Lady of Fatima (Mary) are nonsense not found in the Bible. Jesus told us to pray in His name to the Father, no mention is ever made of Mary. Where in the world did the Catholic religion ever come up with this stuff from?, it certainly wasn't from the Bible. Are the manmade doctrines of the early Catholic Fathers to be accepted as superior to the Word of God? The Vatican believes so. It's sickening that so many millions of people are starving to death around the world while the Vatican is decked out in the finest of precious ornaments, decoration, and priestly garb. While the priests are drinking from cups made of pure gold, children in many nations are drinking muddy water from rivers where animals and people defecate. "Promise" # 12 above says that Mary will "aid in all their necessities." I wonder how many little children who are starving have been fed by Catholicism's Mary. It's obvious to any sensible person Catholicism takes in much more money than it gives out. Our Lady of Fatima is a liar! This article is to WARN people that the Catholic religion is all a bunch of lies, based upon the traditions of men, and NOT upon the inspired and preserved Word of God.